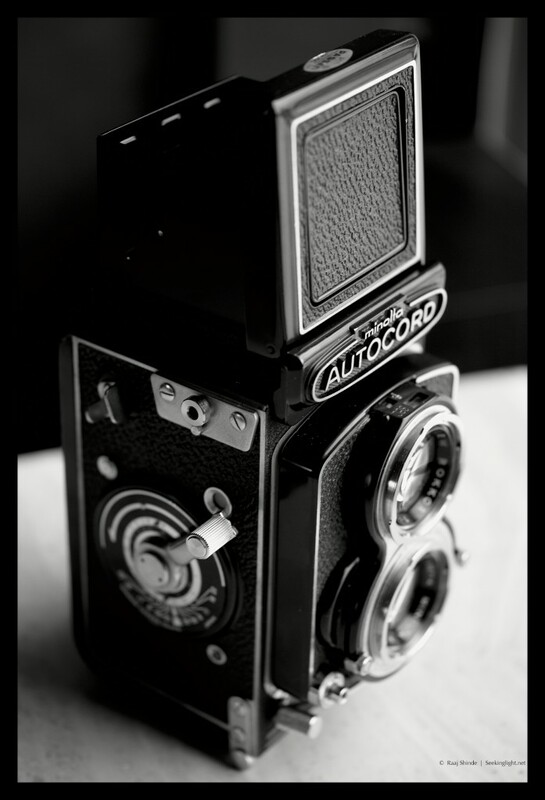 You are here: Home / Cameras / TLR / Minolta Autocord / A Thing of Beauty! 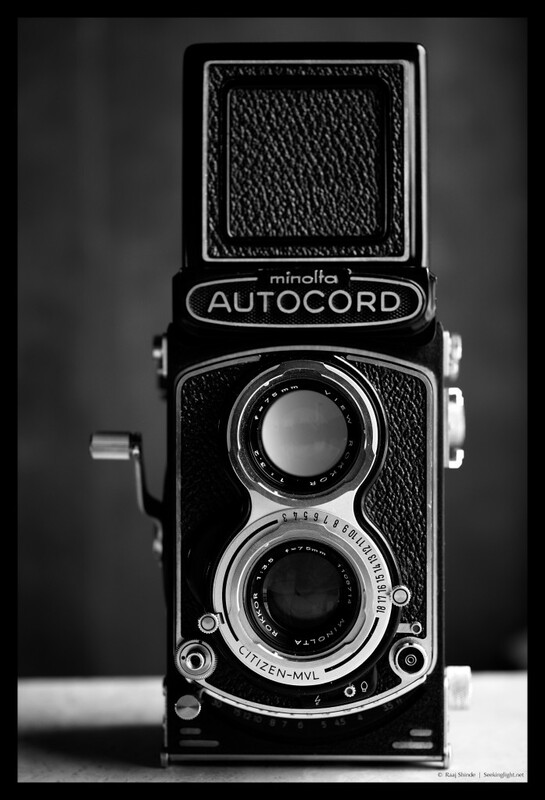 Recently I had an opportunity to acquire a Minolta Autocord Twin Lens Reflex (TLR) camera. I was fortunate to find a single-owner, gently used one, in the original box, with many of the filters and accessories. These lovely cameras were made between 1955 and 1966 and expose 120 film, giving a 6×6 negative. Minolta made 24 different models of 6X6 TLRs, though all use 120 or 220 film and all have 75mm f/3.5 “taking” lenses – the “viewing” lens is a 75mm f/3.2 lens, for a slightly brighter image on the ground glass screen. Some of the lenses were marked “Chiyoko Rokkor” and some “Minolta Rokkor”, though it is believed that they are the same lens. This lens was legendary for it’s image quality. The focusing lever, coupled to a focusing helicoid, is at the very bottom front of the camera. It is so smooth, it’s a joy to use. This version of the camera has focus markings to compensate for focus-shift while shooting infra-red film. This one is serial number 42xxxx, circa 1965, and is the Autocord Model I with a Citizen MVL shutter that does 1/500th of a sec. Another interesting fact about this camera is that both the shutter speed and aperture settings are smoothly variable – you don’t have to go in discrete steps, allowing you to slightly tweak exposure between “hard” f-stops. Mine just came back from a CLT (clean, lubricate, tune up) by a gent that is an expert on these cameras and is ready to go! I’m planning to shoot both B&W and Color film through this beauty. BTW, the images of this beauty above were shot with the Sigma DP3 Merrill, a Foveon sensor based camera that is astonishing me with the quality of monochrome images it generates. I hope to write more about the Sigma soon.